I love a good sale find, but another thing I love just as much is finding a good designer dupe that’s actually good quality for the lower price. 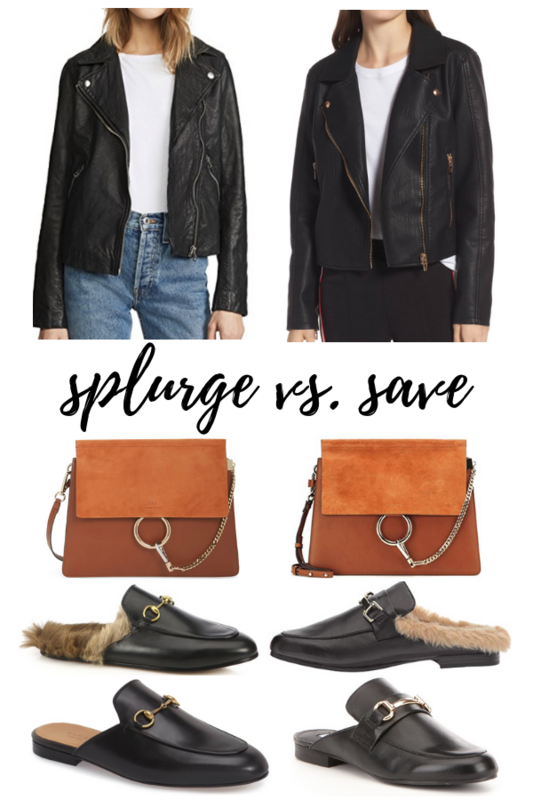 Today I’m bringing back my “splurge vs. save” series – it’s been a while! On the list today is a faux leather jacket, slides and bag. I have all of the “save” options in very similar styles from last year with the exception of the bag, which is a casual $1850 less than the designer version. The faux leather jacket is so comfortable and I always get compliments on it. This year’s version also comes with a removable hood. And I practically live in both versions of the slides – they are a steal and the furry version feels like you’re wearing slippers! Shop both the splurge and save options – including links to more stores that carry the items – using the links and widget below. Have other save finds? Share them in the comments, I’m always looking for others to shop!